Pure Water Gazette » Fluoride, Still Around in 2012? In lots of important ways, the United States leads the civilized world at being backward. Although we somehow worked our way past witch burning, we’ve had trouble keeping up with the rest of the civilized world on issues like capital punishment, dealing with drugs, providing medical care for our citizens, and figuring out the metric system. And when you look at the fact that we’re still, in 2012, intentionally putting a powerful systemic poison into our drinking water, it makes you wonder how we ever got past the fear of witches. Fully 97% of modern western Europeans have reached the conclusion that putting fluoride into the water supply is a bad idea. Nevertheless, fluoridation is still practiced in most parts of the USA. What’s surprising is that a large portion of Americans haven’t even heard that there might be something a little strange about adding the toxic waste products of aluminum and fertilizer plants to the public water supply. Since the idea of selling municipalities toxic industrial waste as a way to prevent dental cavities first popped into the entrepreneurial brain in the middle of the past century, there’s been a battle going on, though most Americans seem blissfully unaware of it. 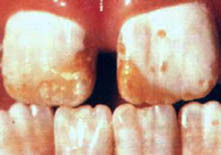 Fluorosis, caused by excessive fluoride. The conventional water treatment industry has remained predictably neutral on public fluoridation over the years, being content to sell products to remove an intentionally added contaminant. Professional associations take no position on the issue and hardly seem to notice its existence. In many ways fluoridation is government welfare for the water treatment industry. One of the really puzzling aspects of fluoridation is that the American Dental Association supports it. This is puzzling because professional organizations do not often, if ever, endorse practices that cost their members money. The truth is that a 1972 report by the American Dental Association stated that dentist earn 17% more profit in fluoridated areas as opposed to non-fluoridated. (Douglas et al., “Impact of water fluoridation on dental practices and dental manpower,” Journal of the American Dental Association; 84:355-67, 1972.) To my knowledge, this is the single study on dentists’ income as it relates to fluoridation. More information about dental treatments that result from fluoridation.